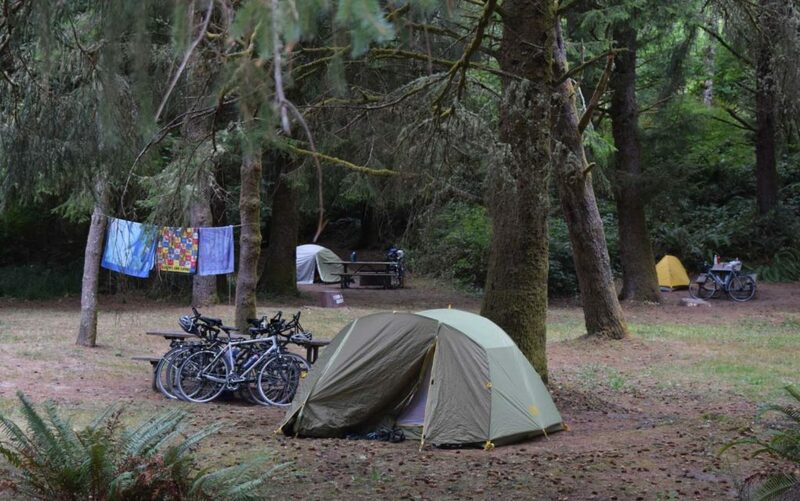 Heading out for a camping trip by bike is gaining in popularity, as you can mix favorite types of recreation together. Why not load up your bike and skip the car? You may just get bitten by the bike travel bug and turn a weekend into a journey. Long-haul cyclists use a touring bike, a style sturdier than a road bike but more comfortable than a mountain bike. Often the bike is steel or aluminum alloy, rather than carbon fiber. (See this REI explainer on frames.) This style comes with welded “braze ons” to which you can attach racks for panniers and other accessories. The heavier frame is more stable when loaded and absorbs road shocks better. Wider tires complete the package. 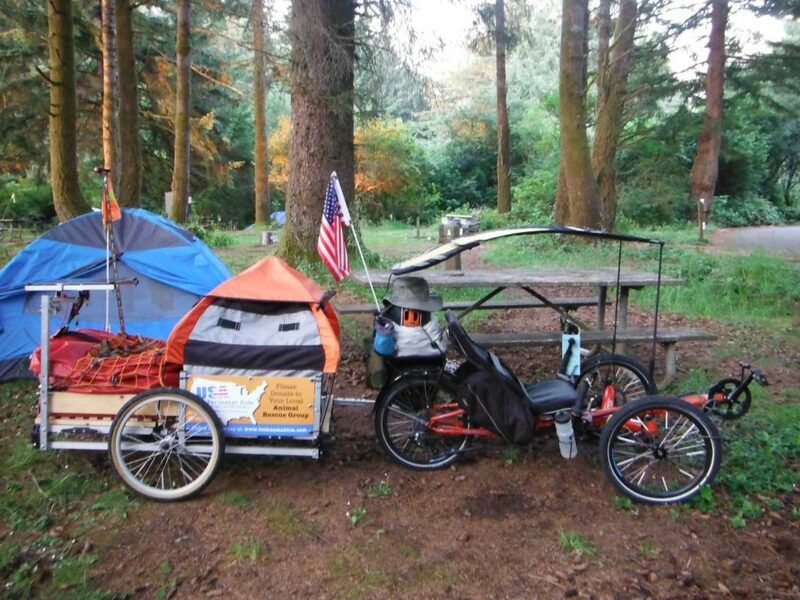 The typical rack arrangement includes a back rack with a flat shelf that allows for panniers (aka saddlebags) to clip onto each side and a tent to be strapped to the shelf. Often a smaller rack will be mounted over the front tire, allowing for two more panniers. A fifth handlebar bag can be attached to hold snacks, camera, phone, maps, etc. Into the panniers go clothes and camping supplies and – if rain is a possibility – your sleeping bag. Nobody likes curling up in a wet bag. You can substitute a hammock for a tent if you’re camping in a warm, dry environment and are sure there will be trees. An ultralight foldable camp chair is a luxury. Take an extra pair of padded bike shorts. That gives you one to wear and one to wash out and strap onto the panniers to dry during the next day’s ride. 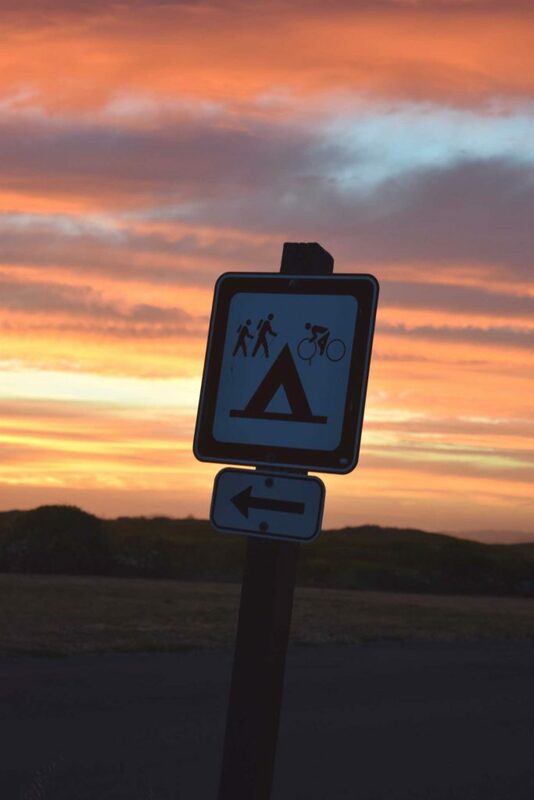 Pack an extra bike jersey or shirt too, as well as a lightweight change of clothes for the camp, including long pants and sandals or river shoes to give your feet a break from constricting bike shoes. For camp comfort, take a visor hat and bug repellant. Sure, you can pull a trailer with tons of stuff in it, including dogs! But consider traveling light. Take a small bottle of camp soap (all purpose for washing clothes, body and cooking gear), a thin cord or expandable clothesline to stretch between trees, and a microfiber camp towel. Downsize toiletries as though carrying on an airplane, and even take them in a gallon-size Ziploc bag. Take sunscreen. The “jet boil” stove is the choice of bike campers. One fuel canister will last for at least four meals, or longer if you just boil water for handy meals like dehydrated dinners, which have gotten tastier and more diverse in recent years. Supplement them with a farmers market or deli stop on your ride. At the last town before camp, you might even pick up cold beverages or wine. Plan on an easy-cook breakfast of instant oatmeal, coffee and fruit. Individual yogurts will keep overnight without spoiling. Take plastic utensils and a plate or bowl, and a single cooking pot with a lid. A jet boil stove (left) is compact, but the gas canisters might be hard to find on the road. I carry some freeze-dried dinners, and supplement them with fresh produce. Look for “hiker-biker” campsites that are in some state and national park campgrounds. These do not require (or allow) pre-reservations. Cyclists simply roll up and register on site, often for a much-reduced camping fee like $5. These are corrals where you pitch your tent next to other cyclists and share picnic tables and fire rings. Most campgrounds also have showers—good to prevent accumulated sweat from causing chafing on the next day’s ride. Typical hiker-biker sites offer a large field that will hold many tents. Bike campers share fire rings and picnic tables. Take a sturdy cable lock and be sure to secure your transportation while you sleep. Some sites have convenient ways to lock your bike. Carry a good lock. If an easy locking post isn’t available, it helps to have a cable to extend your lock’s reach. And use your clothesline to hoist a pannier with food up into a tree or leave it strapped to your bike if you must. Don’t take food into your tent with you, or you may be visited in the night by critters wanting to wreak havoc in your tent.